The prize pool will be donated to a charity of the winners’ choosing. 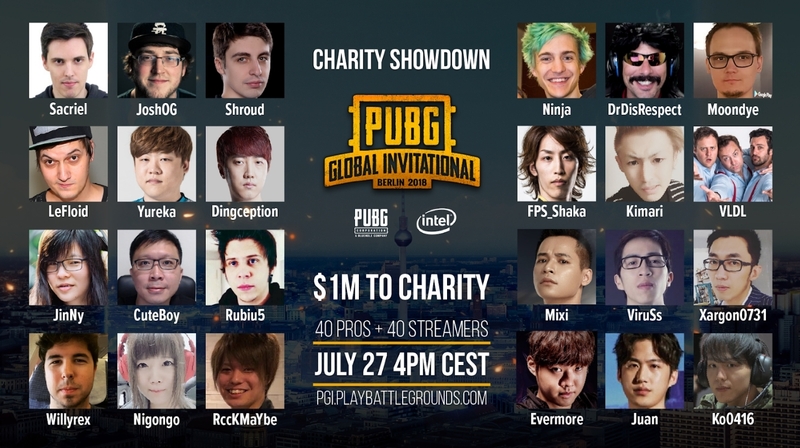 Tyler “Ninja” Blevins, Michael “Shroud” Grzesiek, and Guy “DrDisRespect” Beahm are among the top streamers who will be making the trip to Berlin, Germany next week for a special charity match at the PUBG Global Invitational 2018. The PlayerUnknown’s Battlegrounds Charity Showdown will take place smack dab in the middle of the four-day PGI event, where the best PUBG teams in the world will compete for a $2 million prize pool. Other broadcasters joining the fray include Sacriel, JoshOG, Moondye, LeFloid, Rubiu5, Mixi, FPS_Shaka, and VLDL. In total, 40 streamers will be teaming up with 40 pros in a series of four Squads matches on Erangel. The teams will be comprised of two pros and two streamers each. The squads will duke it out for a prize pool of $1 million that will go directly to the charity of the winners’ choice. The first place squad will win $600,000, the second place squad will win $300,000, and the third place squad wins $100,000. PGI 2018, meanwhile, will be four days full of the top PUBG teams in the world facing off in PUBG Corp’s first major esports event. There are 20 teams left from the hundreds that competed in the qualifiers, including Team Liquid, Ghost Gaming, Natus Vincere, Honey Badger Nation, and AVANGAR. PGI 2018 runs from July 25 to 29. The charity event kicks off next Friday, July 27, at 9am CT at the Mercedes-Benz Arena in Berlin, Germany. Attendees who have tickets to the PGI event can see the charity matches at no additional cost.